Being the budding dragon, one should stay deep under water and don't show off. Being with a second stage strength, one shall appear at the field, and fortune will come its way through a good mentor. Being at level three, one contributes and busily working hard; one should be careful to contribute diligently, but not making big mistakes! Being at level four, one should be courageous enough to express one's uniqueness and ability in actions. Being at level five, the Dragon has become a true leader in the sky, and shall meet with other Dragons there. Being at level six, being one of the best Dragons, one will be lonely and will regret being there! The Oracle expressed a most important element of the Chinese culture: Impress upon others only at the right moment and with the lowest possible level of assertiveness appropriate to the situation, even for one as powerful as the Dragon. Power should be softly apply and should be in an approachable style. Although such wisdom was created in the old Emperor-Dynasty period, it also makes some good sense, perhaps more so, in our modern liberal society, where we have to respect the feelings of our neighbors. It makes good sense to be humble, at the right moment. And it is soft power, rather than hard power. Feminine rather than masculine. 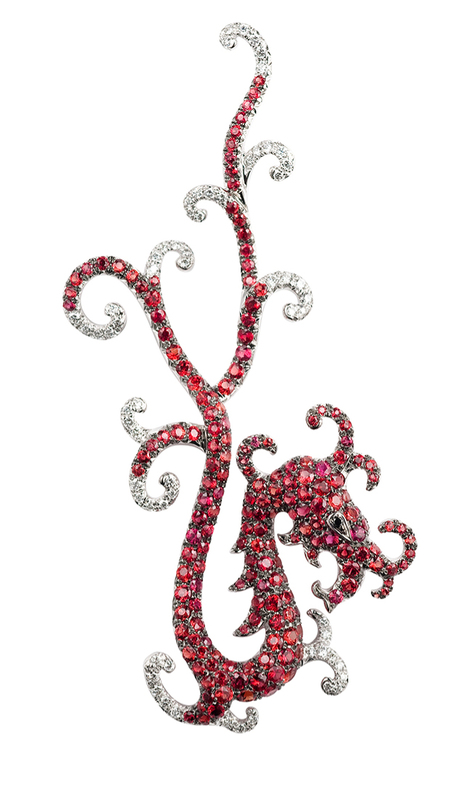 When I designed my Dragon line of jewelry, I tried to figure out a meaningful cultural sub-text of the Chinese dragon, and I concluded: A dragon is to be soft and happy! Here comes my Happy Dragon.